Swan Windows & Son Ltd has recently completed work for a project on BBC One programme DIY SOS. Swan were invited to volunteer and support a build. They jumped at the chance after hearing about the story. On 22 March 2017, 35-year-old Kris Aves attended a London Police Commendation Ceremony and was awarded for his exceptional work as a police liaison officer in the Metropolitan Police. The horrific attacks left 5 people dead, including police officer Keith Palmer and another dozen with very serious injury, including PC Kris Aves. Kris, was returning from the ceremony when he was suddenly mow down by the terrorist in a speeding car. Kris Took the brunt of the collision. It left him with two broken legs, numerous head injuries, a lacerated elbow, damaged left shoulder, sternum and tragically a damaged spinal-cord which has left him wheelchair-bound. Kris now resides at Stoke Mandeville Hospital, Aylesbury, undergoing daily routines to assist with his rehabilitations. His partner Marissa cares for his son 6 and daughter 4 in their home in East Barnet which is now inaccessible to Kris and unsuitable for his rehabilitation. The home needed considerable adaptation throughout and the installation of a through floor lift before Kris can return to his loving family. Ivana Swan from Swan windows says “We were asked to supply new windows to the front and side elevation of the house. These windows had to match the existing style of the house and must be kept in line with the character of the surrounding houses. Robert Swan and Andy Paton did this by installing slim sash white Upvc windows. To accommodate the changes that were being done in the house restricted hinges were put on some of the window to prevent the children from climbing. 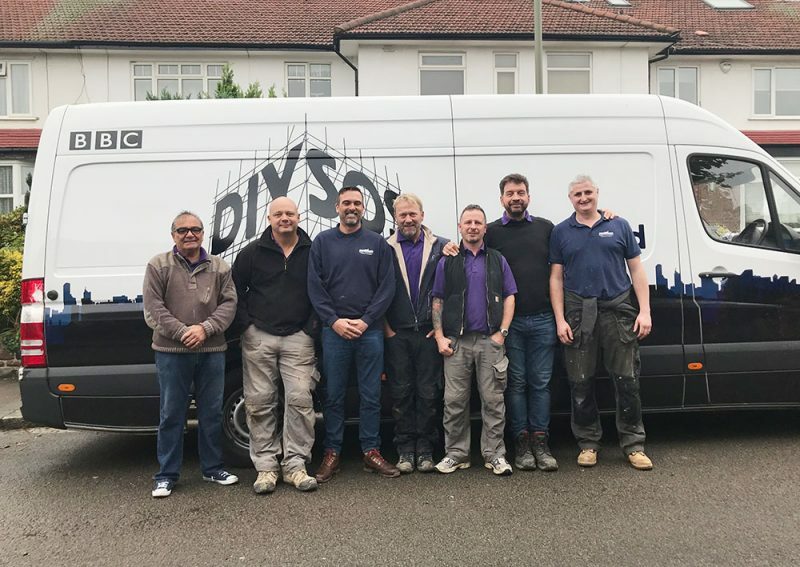 The team had just 10 days to transform a regular 3 bed semi-detached house in to a home that this family could live in happily and safely, and to make sure that Kris would be able to participate in his children’s lives fully regardless of the horrors that have happened to him. “From start to finish the installation went well, we removed the existing windows and replaced them with the new white slim sash upvc product. Once the scaffolding had been removed we were able to return and finish off the front. On day 9 of the Big Build we made sure that everything was just so and ready to hand over to the family on Thursday. The whole experience was amazing. Being part of such a worthwile cause and seeing so many tradesmen giving up their time to work in unison was remarkable. The day of the reveal was a truely emotional experience and one we will never forget. How you can never take anything for granted, your life is so fragile that everything can change in a blink of an eye.